Here's something from an Athens GA band with a terrible name. Glad to see someone putting LT on the web. Love Tractor were in the first wave of Athens, GA bands, like the Side Effects and Pylon, that came about in the wake of the success of the B-52's in 1979. REM were a bit late to the show and got started a bit later than everyone else. 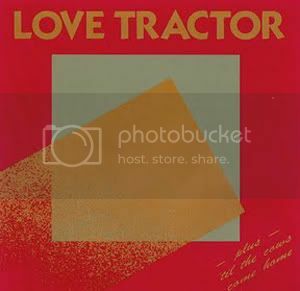 Their 1st LP is titled: "Love Tractor" and has the red and gold cover you posted as a jpg It was released in 1981. In 1982 'Till the Cows Come home came out, an ep with a cover of Kraftwerk's 'Neon Lights' as a cover, where they actually sang! Next was Around the Bend in '83, then Wheels of Pleasure in '84, then Spaceship in '87 on the VERY ill-fated BigTime label. By this time the early LT was on CD and was available, but I still have my original vinyl of the classic first 3 releases. These two tracks are from 1981 from the first LP, released before REM did a thing and after Pylon released their first sides of wax.